Notes: Though normally we prefer the unambiguous term "OAV" (original animation video), we use OVA (original video animation) here to coincide with the labeling on the North American release. 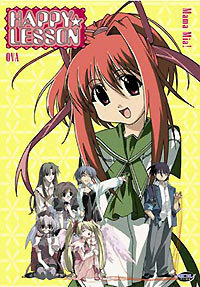 Only the first three episodes were released in North America. The other two episodes, which were released much later, were only released in Japan. Hitotose Chitose lives with five of his teachers who also double as his self-appointed mothers. And when his "sisters" from the orphanage appear in his life, things really start to become crazy. Writing the review for the OAV series of Happy Lesson has proven to be one of the more aggravating things I've done. Initially, I was of the impression that the show was three episodes. Then, someone contacts me and refers to the official page of the OAV, which shows that the HL OAV's are, in fact, consisting of five episodes. Or so it seemed. I can only assume that the two last episodes that, to my knowledge, would feature more introductions of the residents of Chitose's house. For whatever reasons, however, they were never to be released. The HL OAV DVD released by ADV does, in fact, feature three episodes. For those of you who've read my earlier versions of the HL reviews, you might probably remember that I was rather fond of Happy Lesson up to the point of the Advance series. The reason for that is simply the fact that, despite its own self-constricting genre, it delivered quite a lot of entertainment that went some ways beyond what I initially expected. Well, the TV series did, anyway. The problem with the OAV is that it's too short to be of any particular value for those who haven't seen the TV series. By the time I watched the OAV, I had already devoured said TV series, and treated the OAV as an addition to said series. They even share the same first episode, only the OAV has some additions due to being a few minutes longer. However, the second and third episodes diverges from the TV series quite a lot, and while they aren't outright bad, I suppose the lack of background information about the various characters -- which only the TV series provide -- you're not going to be very satisfied with it. Basically, the best way of looking at the OAV is to consider it as some sort of an official add-on. If you've already seen the TV series, there might be some kicks to be had from this one, providing you LIKED the TV series. If you haven't even heard about the show at all, then this isn't the place to start. So yes, from what I understand, the OAV could have been a more than decent product in the end, but the production and release of the TV series make the OAV somewhat redundant. Watch only if you're really into this show. Recommended Audience: Slapstick violence ahoy. Also, some minor fan service.